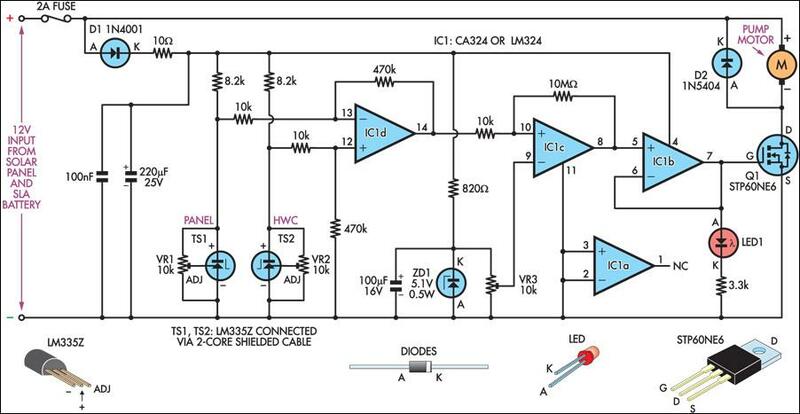 This circuit optimises the circulation of heated water from solar hot water panels to a storage cylinder. It achieves this by controlling a 12V DC pump, which is switched on at a preset temperature differential of 8°C and off at about 4°C. This method of control has distinct advantages over some systems that run the pump until the differential approaches 0°C. 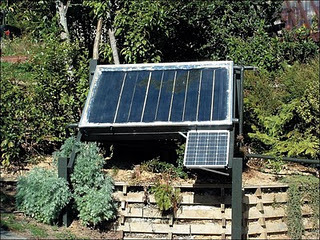 In such systems, the pump typically runs whenever the sun shines. 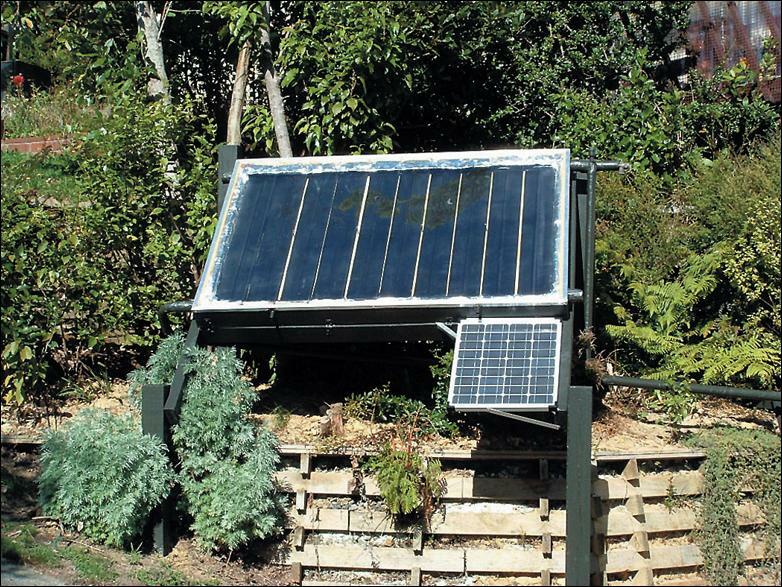 A small 10W solar panel charging a 12V SLA battery is sufficient to run the controller. Most commercial designs use 230VAC pumps, which of course don’t work when there is a power outage or there is no AC power at the site. Temperature sensors TS1 & TS2 are positioned to measure the highest and lowest water temperatures, with one at the panel outlet and the other at the base of the storage cylinder. 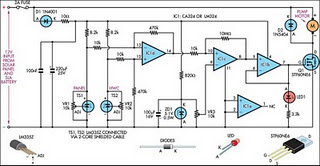 The difference between the sensor outputs is amplified by op amp IC1d, which is configured for a voltage gain of about 47. As the sensors produce 10mV/°C, a difference of 8°C will produce about 3.76V at the op amp’s output (pin 14). The output from IC1d is fed into the non-inverting input (pin 10) of a second op amp stage (IC1c), which is wired as a voltage comparator. The op amp’s inverting input (pin 9) is tied to a reference voltage, which can be varied by trimpot VR3. When the voltage from IC1d exceeds the reference voltage, the output of the comparator (pin 8) swings towards the positive rail. A 10MW resistor feeds a small portion of the output signal back to the non-inverting input, adding some hysteresis to the circuit to ensure positive switching action. A third op amp stage (IC1b) acts as a unity-gain buffer. When the comparator’s output goes high, the buffer stage switches the Mosfet (Q1) on, which in turn energises the pump motor. Mosfet Q1’s low drain-source on-state resistance means that in most cases, it won’t need to be mounted on a heatsink. The prototype uses a Davies Craig EBP 12V magnetic drive pump, which draws about 1A when running and is suitable for low-pressure hot water systems only (don’t use it for mains-pressure systems as it may burst!). For mains-pressure systems, the author suggests the SID 10 range of brass-body magnetic drive pumps from Ivan Labs USA. Each LM335 temperature sensor and its associated trimpot is glued to a small copper strip using high-temperature epoxy. It is then waterproofed with silicon sealant and encapsulated in heatshrink tubing. Standard twin-core shielded microphone cable can be used for the connection to the circuit board. Before sealing the two units, adjust their trimpots to get 2.98V at 25°C [(ambient temperature x .01) + 2.73V] between the "+" and "-" terminals. When both have been adjusted, clamp them together and allow their temperatures to stabilise for a few minutes. Next, measure the output voltage from the differential amplifier (IC1d), which should be close to 0V. If not, tweak one of the pots until it is. Separate the two and warm the panel sensor (TS1), monitoring the output of IC1d. You should see a marked increase in voltage, remembering that an 8°C difference between the sensors should give an output of about 3.76V. The pump switch-on point is set by VR3 and can be adjusted over a practical range of about 4-10°C differential (1.88-4.70V). Adjust VR3 to get about 3.8V on pin 9 of IC1c as a starting point. If set too low and the panels are located far from the cylinder, much of the heat will be lost in the copper connecting pipes. On the other hand, if set too high and the weather is mostly cloudy, then the pump will not switch on very often, as the panels will not get hot enough. For best results, use copper pipes for the panel plumbing and insulate them with tubes of closed-cell foam. As the pipes cool down between pump operations, small diameter pipes of 15mm are more efficient than larger sizes as they contain less static water. In practice, the pump in the author’s setup switches on for about 30 seconds every 4-5 minutes. As the Davies pump shifts 13 litres/minute, it displaces the heated water from a single panel in about 14 seconds. There is a thermal lag in the sensor readings, so after the pump stops, the temperature difference will keep decreasing for 40 seconds or so as the panel sensor cools down and the cylinder sensor heats up.